At the age of fourteen, Asuka finished college. That same year she piloted her first Eva Unit. She became a member of the elite team of special fourteen year old. These "children" were basically born to pilot the Eva's. 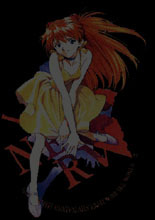 Asuka became the designated pilot of Eva-02. Asuka considers herself and her Eva to be the best. She absolutely loves piloting her Eva. Asuka proved in combat a worthy foe, fearless and indestructible. Initially, Asuka, had the highest synchronization-rate, but her past kept her from achieving everything she had the potential to be. After a battle that did not go well, her facade of strength broke down and she lost her ability to pilot the EVA. The fragile state from her painful past caused her to shatter. What remained was not, the former, Asuka at all. Past : Her mother committed suicide when she was very young. Her dad remarried soon after! She withdrew from her father and stepmother, unable to accept either of them, this forced Asuka to build a protective shell around herself.